It was reported yesterday (3/2/2017) in the Guardian Newspaper that the newly-elected U.S. President, Donald Trump, had ‘moved to roll back the financial regulations brought in after the last financial crisis’. Those regulations came in the form of the sweeping Dodd-Frank Wall St. Reform and Consumer Protection Act 2010, and whilst the President’s orders do not signal the repeal of the Act (only Congress can repeal the Act), the order does represent an alarming sentiment. The campaign of Donald Trump was defined by sensationalist rhetoric, on both sides of the U.S. political divide, so it is wise not to contribute to that. However, the report yesterday contains two extremely worrying elements that must be considered; the severity of both can be understood when we look at the development after the last great collapse of the U.S. economy – the Great Depression. After the Great Depression of the 1930s, the U.S. Administration of Roosevelt initiated the ‘New-Deal Era’ which one scholar argues brought about 70 years of financial balance – also known as the ‘Quiet Period’; whilst the New-Deal era policies can be debated as to their motives or ambitions, the fact that there was no widespread crash before the deregulatory-era of the 1990s brought about the Financial Crisis of 2007/08 supports this notion of ‘properly designed bank regulations can prevent financial crises for a significant period of time’. So, with that in mind, two elements from yesterday’s report are striking. Firstly, whilst the President’s Press Secretary, Sean Spicer, argues that ‘we desperately need to overhaul how we approach financial regulation… [Dodd-Frank was a] disastrous policy’, it is in fact the President’s own remarks that reveal the underlying nature of this regulatory approach: ‘We expect to be cutting a lot out of Dodd-Frank, because frankly I have so many people, friends of mine, that have nice businesses that can’t borrow money’. Gary Cohn, Director of the National Economic Council, and formerly the Chief Operating Officer at Goldman Sachs, went further by suggesting that the executive order was ‘a table-setter for a bunch of stuff that is coming’. Yet, as we strive to be critical, but fair, it is important to note that whilst Dodd-Frank was needed, it was not perfect. There are a number of elements that can be argued as being over-burdensome or too wide-ranging (I have been critical, for example, of the Dodd-Frank Act’s approach to Credit Rating Agency regulation). Yet, whilst this may lessen the scorn for President Trump’s recent acts, there is another, slightly more downplayed element of the 3rd of February report that throws this understanding into considerable doubt. Even though the report continues by stating that the Trump Administration will seek to end the so-called ‘Volcker-Rule’, which is concerned with placing systemic firewalls between a bank’s consumer and risk-taking endeavours (the amalgamation of which is called ‘Universal Banking’), that is not the most concerning development. The most concerning development is the reported targeting of the Consumer Financial Protection Bureau, which has proven to be an effective Watchdog and has reportedly returned over $11 billion to victims of financial crime and malfeasance, leading one director of a lobbying group for financial reform to proclaim that this move, in particular, is a ‘stunning betrayal of what Trump promised, and that was to protect us from standing up to Wall Street’ – herein lies the rub. Donald Trump’s sensational victory in the U.S. Presidential Election will live long in the memory. Yet, it is feared that it will not be the sensational element that lives long, but the damage that he causes. Whilst I will not pass comment on the roles of Republican or Democratic Administrations, understanding who is in Trump’s Administration will reveal one truth above all else: who the Administration is designed to serve. In terms of the Administration’s financially-concerned position alone, the list is revealing. Steven Mnuchin is the Treasury Secretary and a former Goldman Sachs Executive. Wilbur Ross is the Commerce Secretary and has ties to the New York Investment House N.M. Rothschild & Sons and the infamous investor Carl Icahn, who himself has been appointed as a ‘Special Advisor on Regulatory Reform’. In fact, President Trump’s Executive Order was borne out of a meeting with JPMorgan Chase’s Jamie Dimon and BlackRock’s Larry Fink, further emphasising the connections between Trump and big business. But this connection between the White House and Wall Street is nothing new – President Obama’s Treasury Secretary was Citigroup’s Jack Lew, for example. What is of concern is the timing of President Trump’s actions. The last ‘quiet-period’ was preserved for over 70 years until the deregulatory phase of the 1990s, backed by the infiltration of Government by self-interested Financial officials, took hold. Then, one of the most socially-destructive financial collapses sent the globe into a tail-spin. Now, just 9 years after an event that sent suicides, ill-health and general depravation soaring, President Trump believes that we are ready to move on. It took 70 years for society to be able to withstand the attack of self-interested greed emanating from the privileged few, and even then we are still suffering – there is no way that society is ready for another onslaught after just 9 years. President Trump’s rhetoric should be of concern, and the actions taken to benefit the privileged at the direct cost of the public should be fought against with great endeavour. Whilst the issues of civil liberty dominate headlines, it is the deregulatory rhetoric, so close to the last financial crisis, that arguably represents the greatest danger to modern society. 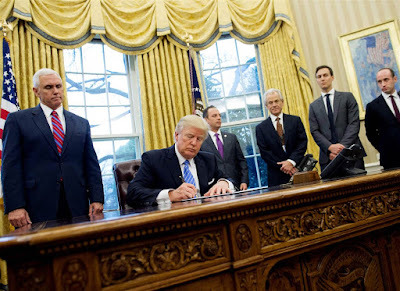 Dominic Rushe ‘Trump orders Dodd-Frank review in effort to roll back financial regulation’ (2017) Guardian (3 Feb) https://www.theguardian.com/us-news/2017/feb/03/trump-dodd-frank-act-executive-order-financial-regulations. Gary Gorton Misunderstanding Financial Crises: Why We Don’t See Them Coming (OUP USA 2012) 4. For an excellent discussion on the inadequacies of the Dodd-Frank Act see Edward J. Kane ‘Missing Elements in US Financial Reform: A Kübler-Ross Interpretation of the Inadequacy of the Dodd-Frank Act’  36 Journal of Banking & Finance. Nathan Vardi ‘Donald Trump Signals Return of Wall Street-Friendly Era’  Forbes (3 Feb.) http://www.forbes.com/sites/nathanvardi/2017/02/03/donald-trump-signals-return-of-wall-street-friendly-era/#630f813c7b4e.